New to the AARONCO Tool Collection, these ergonomically designed strippers fit the hand better and stay more comfortable for longer than traditional stripping tools. Made from beautiful handcrafted hardwoods and blades forged from Japanese steel in sizes: Coarse, Medium, Fine. These fine quality stripping knives quickly remove dead hair and undercoat. The Aaronco stripping knife can be used for carding and plucking on show coats too! Comfort grip, riveted wooden handles provide excellent control and helps reduce hand fatigue. Stainless steel blades are durable, effective, and will not rust. 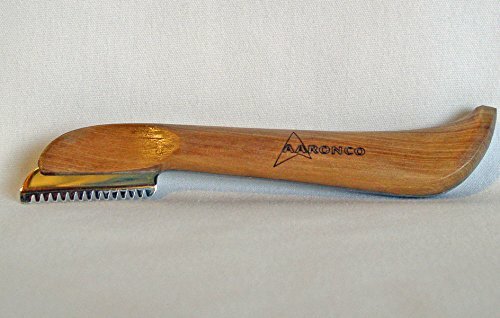 The Aaronco stripping knives are the best steel blades for the most challenging grooming tasks. Fine stripping blades remove more hair, medium and coarse blades remove less hair. Great Quality at a Great Price! If you have any questions about this product by Aaronco, contact us by completing and submitting the form below. If you are looking for a specif part number, please include it with your message.